Question: An attorney left our firm. How do we delete her as a service contact for the cases she was handling? Answer: There are a couple of ways to do so. The methods described below also apply to non-attorney firm service contacts. One way is described in this FileTime Knowledge Base article. This method may be utilized by any registered firm member. However, if yours is a large firm or your firm has many cases, it may be faster to use the method described below. However, only a firm eFiling administrator can perform this task. Click the Admin button (A) on the top navigation bar. Click Services (B) on the sub-navigation bar and then click Firm Service Contacts (C)on the drop-down menu. Find the name of the attorney and click the + sign in the far left column for that person (D). You will see the Case tab open below the person's name. 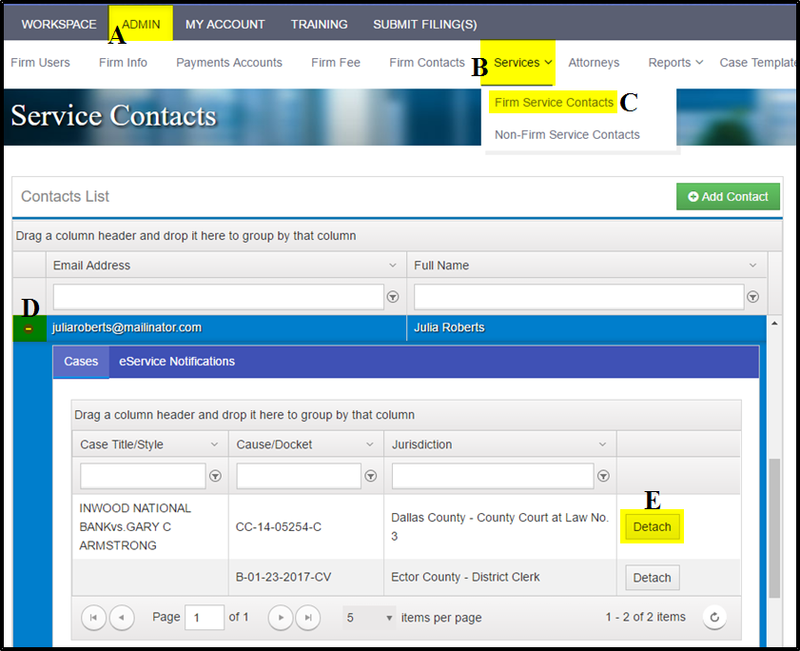 Click the Cases tab to display the list of firm cases for which this person is associated as a firm service contact. Click the Detach button (E) for each case for which you want to dissociate this person as a firm service contact.